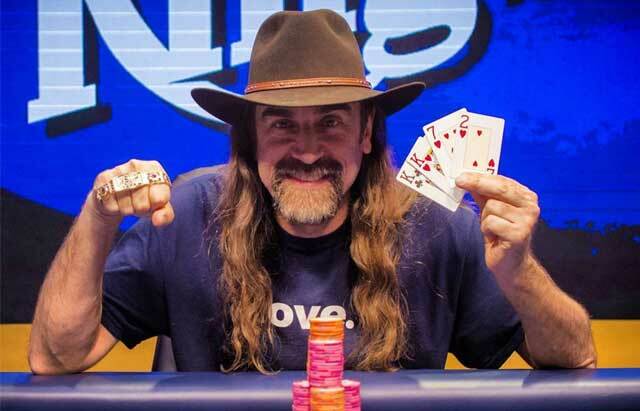 Chris ‘Jesus’ Ferguson won his sixth World Series of Poker bracelet on Wednesday when he took down WSOPE Event #7 (€1,650 Pot Limit Omaha 8 or Better) for €39,289. With the victory, Ferguson, the current WSOP Player of Year points leader, extended his first place margin over both Ryan Hughes and John Racener, the players nearest to him in the race. Shedding his traditional urban cowboy garb, Ferguson took to the table with a navy T-shirt with a single word silkscreened in the center chest reading “love.” While Ferguson clearly loved the result, not everyone who received word of his victory was feeling what his shirt was preaching. Ferguson, a central figure in the Full Tilt Poker financial collapse, has yet to publicly comment on the fiscal disaster that left thousands of poker players funds trapped in limbo for years. His silence has led to resentment by some members of the poker community, while others have opted not to hold a grudge against Ferguson since he’s returned from his self-imposed exile. Both sides took to social media to comment on the bracelet win for the controversial champion. Comments directed at Ferguson himself were at a minimum early on. It was actually 14-time WSOP bracelet winner Phil Hellmuth’s congratulatory tweet that seemed to generate the most buzz. For the most part, Phil’s picture posing and #POSITIVITY was met with ire. Jesus….. Why are people so quick to forget what these scumbags did? They’re criminals, and shouldn’t be treated like legends. #nutkick. Now that the scumbag has some money maybe he can pay back some of the people he robbed at Full Tilt. Maybe the most damning reply came from, no surprise, Daniel Negreanu and he took issue with Hellmuth’s seemingly tone deaf approach. Couldn’t find time to grab a selfie with Harvey Weinstein, Chris Brown, or Bernie Madoff? Next best thing I guess. At the time of this posting, the feedback and comments were abundantly critical. But the 2017 WSOP Player Of The Year frontrunner was not without his supporters. Very cool Phil. I’m glad to see you post a pic with him. I think it’s been too long and people need to move on. Class act! Ferguson continues to march to the 2017 World Series of Poker Player of the Year as the final points will be tallied at the conclusion of the WSOPE Main Event which begins on November 4.